Following a successful launch on 18 April 2018 aboard a SpaceX Falcon 9 rocket from SLC-40 at the Cape Canaveral Air Force Station, Florida, TESS was injected into an orbit aligned for a gravity assist maneuver one month later with the Moon to send the telescope into its operational 13.65-day orbit of Earth. TESS’s orbit is highly unique, with the trajectory designed so the telescope is in a 2:1 resonance with the Moon at a 90° phase offset at apogee (meaning the telescope maintains a separation from the Moon so the lunar gravity field doesn’t perturb TESS’ orbit but at the same time keeps the orbit stable) to allow the spacecraft to use as little of its maneuvering fuel as possible to achieve a hoped-for 20 year life. At the time of launch, mission scientists and operators noted that first light images were expected from TESS in June 2018 following a 60-day commissioning phase. While it is not entirely clear what happened after launch, what is known is that the commissioning phase lasted 27 days longer than expected, stretching to the end of July. TESS’ first science and observational campaign began not in June but on 25 July 2018. 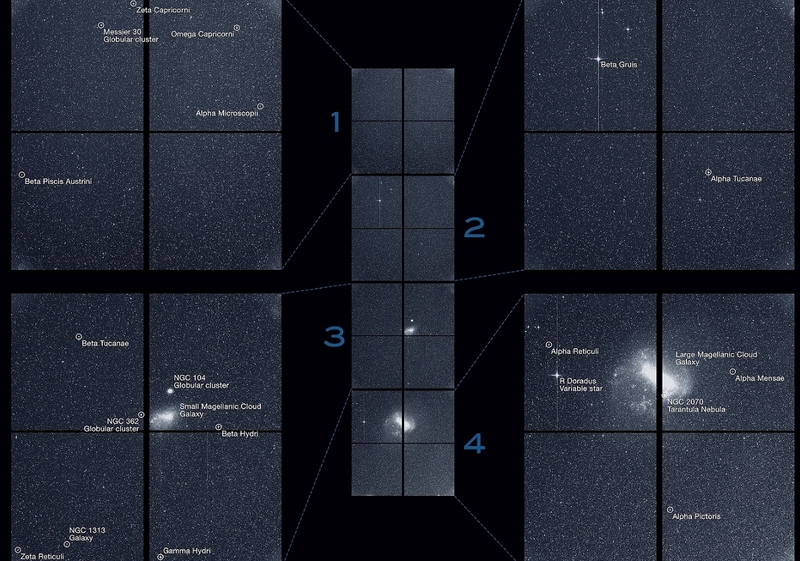 By 7 August, the halfway point in the first science observation period, TESS took what NASA considers to be the ceremonial “first light” images of the telescope’s scientific ventures. TESS acquired the image using all four cameras during a 30-minute period on Tuesday, 7 August. The images include parts of a dozen constellations from Capricornus to Pictor, both the Large and Small Magellanic Clouds, and the galaxies nearest to our own. While TESS orbits Earth every 13.65 days, its data collection phase for each of its 26-planned observation sectors of near-Earth sky lasts for two orbits so the telescope can collect light data from each section for a total of 27.4 days. With science operations formerly commencing on 25 July, the first observational campaign stretched to 22 August. Unlike some missions which only transmit data back to Earth after observational campaigns end, TESS transmits its data both in the middle and at the end of each campaign when the telescope swings past its perigee (closest orbital approach to Earth). On 22 August, after TESS completed its first observation campaign of a section of the Southern Hemisphere sky, the telescope transmitted the second batch of light data to Earth through the Deep Space Network. From there, the information was processed and analyzed at NASA’s Science Processing and Operations Center at the Ames Research Center in California – which provided calibrated images and refined light curves for scientists to analyze and find promising exoplanet transit candidates. NASA and MIT then made that data available to scientists as they search for the more than 22,000 exoplanets (most of those within a 300 light-year radius of Earth) that TESS is expected to find during the course of its two-year primary mission. Given the sheer number of exoplanets TESS is expected to find in the near-Earth neighborhood, it is not surprising that the first observation campaign has already returned potential exoplanet candidates – the first of which was confirmed by NASA via a tweet on Wednesday, 19 September. TESS’ first exoplanet candidate is Pi Mensae c – a super-Earth with an orbital period of 6.27 days. According to a draft of the paper announcing the discovery, several methods were used to eliminate the possibility of this being a false detection or the detection of a previously unknown companion star. The Pi Mensae system is located 59.5 light years from Earth, and the new exoplanet – if confirmed – would be officially classified Pi Mensae c, the second known exoplanet of the system. Exoplanet’s official classifications derive from the name of the star they orbit followed by a lowercase letter indicating the order in which they were discovered in a particular system. The order in which exoplanets are discovered does not necessarily match the order (distance from closest to farthest) in which they orbit their parent star. Moreover, the lowercase letter designation begins with the letter “b”, not the letter “a”. Thus, the first discovered exoplanet in a particular system will bear the name of its parent star followed by a lowercase “b”. Subsequent exoplanets orbiting the same start or stars (as the case may be), regardless of whether they orbit closer to or farther away from the parent star than the first discovered exoplanet will then bear the letters c, d, e, etc. Therefore, confirmation of the new exoplanet candidate in the Pi Mensae system would make the planet Pi Mensae c.
Pi Mensae b, a superjovian, was discovered on 15 October 2001 using the radial-velocity method of detection via the Anglo-Australian Telescope operated by the Australian Astronomical Observatory at Siding Spring Observatory. In the search for exoplanets, two general methods of detection are used – direct observation of a transiting exoplanet that passes between its star and the observation point on or near Earth (the method employed by TESS) and the radial-velocity, or doppler spectroscopy, method of detection which measures the wobble or gravitational tug on a parent star caused by an orbiting planet that does not pass between the star and the observation point on or near Earth. Overall, roughly 30% of the total number of known exoplanets have been discovered via the radial-velocity method, with the other 70% being discovered via the transiting method of detection. 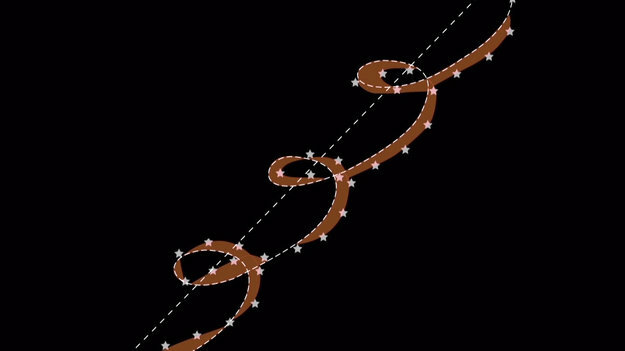 Upon Pi Mensae b’s discovery in 2001, the planet was found to be in a highly eccentric 5.89 Earth-year (2,151 day) orbit – coming as close at 1.21 AU and passing as far as 5.54 AU from its star. With a 1.21 AU periastron, Pi Mensae b passes through its parent star’s habitable zone before arcing out to apastron (which lies farther out than Jupiter’s orbit of our Sun). Given the extreme eccentricity and the fact that the planet passes through the habitable zone during each orbit, it would likely have disrupted the orbit of any potentially Earth-like planet in that zone due to its extreme mass of more than 10 times that of Jupiter. As for Pi Mensae itself, the star is a 3.4 billion year old (roughly 730 million years younger than the Sun) yellow dwarf that is 1.11 times the mass of the Sun, 1.15 times the Sun’s radius, and 1.5 times the Sun’s luminosity. Due to its proximity to Earth and its high luminosity, the star has an apparent magnitude of 5.67 and is visible to the naked eye in dark, clear skies. The star’s brightness – unsurprisingly – gives a potential instant “win” for the TESS team, whose stated pre-mission goal was to find near-Earth transiting exoplanets around exceptionally bright stars. Pi Mensae is currently the second brightest star to host a confirmed transiting exoplanet, Pi Mensae b. As an even greater testament to TESS’ power, just hours before publication of this article, the TESS team confirmed a second exoplanet candidate from the first observation campaign. The second exoplanet candidate is LHS 3844 b. It orbits its parent star – an M dwarf – every 11 hours and is located 49 light years from Earth. Given the wealth of light data for scientists to pour through from the now-completed first two of 26 observation sectors, it is highly likely that hundreds if not thousands of exoplanets candidates will be identified in the coming months and years — with tens of thousands of candidate planets to follow in the remaining 24 sectors of sky to be searched. Dyson spheres are hypothetical megastructures built by extraterrestrials for the purpose of harvesting all of a star’s energy. Here’s how the European Space Agency’s Gaia mission might help find one. Artists’ concept of a Dyson sphere. Notice the little moon or planet on the left side, being ravaged for raw materials. This image – called Shield World Construction – is by Adam Burn. Via http://www.FantasyWallpapers.com. When contemplating extraterrestrial intelligence, one of the most tantalizing ideas is that a super-advanced alien civilization could build an enormous structure around its home star, to collect a significant portion of the star’s energy. This hypothetical megastructure is popularly known as a Dyson sphere. It’s a sci-fi-sounding concept, but some scientists have also seriously considered it. This week, a story emerged about how the European Space Agency’s Gaia mission – whose primary purpose is to create a 3D map of our Milky Way galaxy – might be instrumental in the search for Dyson spheres. In the past, searches for Dyson spheres have focused on looking for signs of excess infrared or heat radiation in the vicinity of a star. That would be a telltale signature, but those attempts have come up empty, so far. The new peer-reviewed study – which was published in The Astrophysical Journal on July 18, 2018, and later described in Astrobites – proposes looking for Dyson spheres with little or no infrared excess. In other words, it describes a technique not attempted before. Erik Zackrisson at Uppsala University in Sweden led the new study. It focuses on a type of Dyson sphere that would’ve been missed by prior searches focused on infrared radiation. Suppose you were looking toward a Dyson sphere. What would you see? The visible light of the star would be reduced significantly since the Dyson sphere itself – by its nature – would mostly surround the star for purposes of energy collection. The star would continue shining; it would be shining on the inner portion of the Dyson sphere. Presumably, the star’s radiation would heat the sphere. 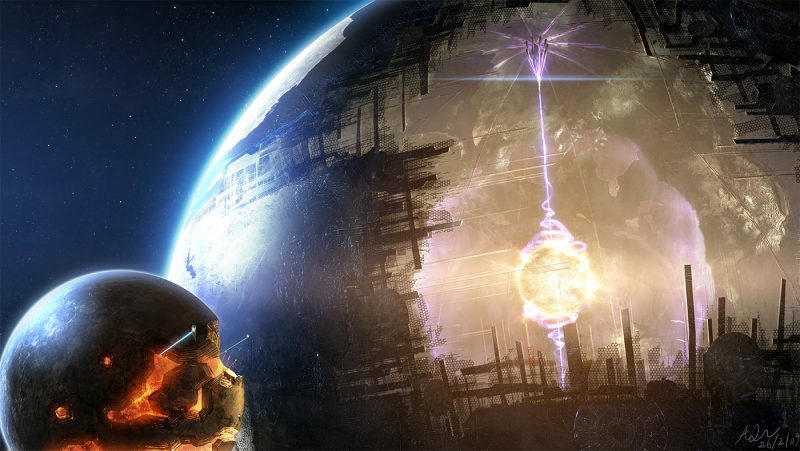 According to earlier thoughts by scientists on the subject, a Dyson sphere should have a temperature between 50 and 1,000 Kelvin (-370 to 1300 degrees Fahrenheit; -220 to 730 degrees Celsius). At that temperature, radiation from the sphere would peak in infrared wavelengths. That was the earlier idea, until Zackrisson’s study. 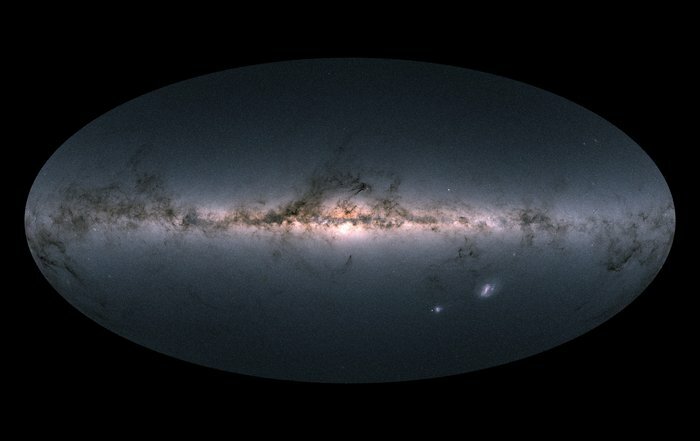 An all-sky view of the Milky Way and neighboring galaxies from the Gaia mission. This view includes measurements of nearly 1.7 billion stars. Image via Gaia Data Processing and Analysis Consortium (DPAC)/A. Moitinho/A. F. Silva/M. Barros/C. Barata – University of Lisbon, Portugal/H. Savietto – Fork Research, Portugal. His study suggests the possibility that the sphere might be composed of a different kind of material than what had been previously supposed. Suppose this material had the ability to dim the star’s light equally at all wavelengths? That would make it a so-called gray absorber and would significantly affect methods used to search for Dyson spheres. If you measured the star’s distance spectrophotometrically – by comparing the star’s observed flux and spectrum to standard stellar emission models – then the measurements would suggest that the star is farther away than it actually is. But then if you measured the star’s distance using the parallax method, you’d get a different number. The parallax method compares the apparent movement of a nearby star against the stellar background, as Earth moves from one side of its orbit to another across a period of, say, six months. The size of a Dyson sphere could be determined by comparing the difference in distances between these two methods. The greater the difference, the greater the amount of the star’s surface that is being obscured by the sphere. In other words, using this new method, astronomers have found candidate Dyson sphere stars. Graph showing distribution of covering fractions for all stars in the Gaia-RAVE database overlap (left) and just those stars with less than 10 percent error in their Gaia parallax distance and less than 20 percent error in their RAVE spectrophotometric distance (right). If the parallax distance is smaller than the spectrophotometric distance, that is interpreted this as a negative covering fraction, and could be an indication of a Dyson sphere surrounding that star. Image via Zackrisson et al. 2018. The Gaia mission is currently charting a three-dimensional map of our galaxy, providing unprecedented positional and radial velocity measurements with the highest accuracy ever. The goal is to produce a stereoscopic and kinematic census of about one billion stars in the Milky Way galaxy and throughout the Local Group of galaxies. As it happens, these data are very useful when searching for Dyson spheres. Using the parallax distances from the first data release of Gaia, Zackrisson and his colleagues compared that data to previously measured spectrophotometric distances from the Radial Velocity Experiment (RAVE), which takes spectra of stars in the Milky Way. This resulted in an estimate of what percentage of each star could be blocked by Dyson sphere material. 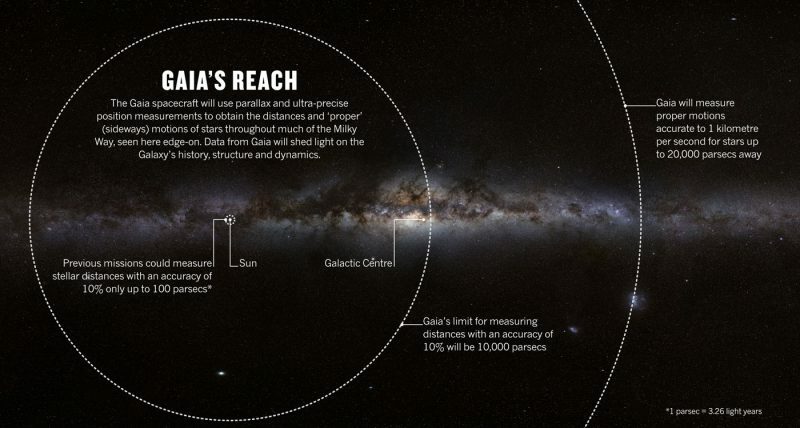 Illustration of how Gaia is measuring the distances to most stars in the Milky Way with unprecedented accuracy. Image via S. Brunier/ESO; Graphic source: ESA. Of course, figuring out if any of these could actually be Dyson sphere candidates required further analysis. Zackrisson and his team decided to focus on main-sequence stars (like the sun), spectral types F, G and K, and narrowed those down to those which displayed a potential blocking fraction greater than 0.7. Larger giant stars were removed from the data set since their spectrophotometric distances tend to be overestimated compared to main-sequence stars. This alone left only six possible candidates. Those in turn were then narrowed down to only two, after eliminating four candidates due to problems with the data itself. One of those, the star TYC 6111-1162-1, was then considered to be the best remaining candidate. The vast catalogue of celestial objects expected from Gaia’s scientific haul will not only benefit studies of our own Solar System and Galaxy, but also the fundamental physics that underpins our entire Universe. The mass of a very young exoplanet has been revealed for the first time using data from ESA’s star mapping spacecraft Gaia and its predecessor, the quarter-century retired Hipparcos satellite. The planet was only discovered in 2008 in images captured by the Very Large Telescope at the European Southern Observatory in Chile. Both the planet and the star are only about 20 million years old – roughly 225 times younger than the Solar System. Its young age makes the system intriguing but also difficult to study using conventional methods. This behaviour makes it difficult for astronomers to accurately measure the star’s radial velocity – the speed at which it appears to periodically move towards and away from the Earth. Tiny changes in the radial velocity of a star, caused by the gravitational pull of planets in its vicinity, are commonly used to estimate masses of exoplanets. But this method mainly works for systems that have already gone through the fiery early stages of their evolution. And then there is something that the astronomers describe as ‘tiny wobbles’ in the trajectory of the star across the sky – minuscule deviations from the expected course caused by the gravitational pull of the planet in the star’s orbit. This is the same wobble that can be measured via changes in the radial velocity, but along a different direction – on the plane of the sky, rather than along the line of sight. 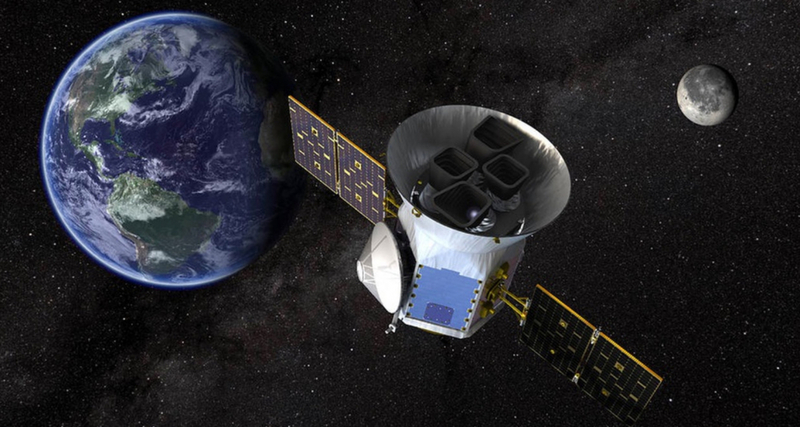 The Gaia mission, designed to observe more than one billion stars in our Galaxy, will eventually be able to provide information about a large amount of exoplanets. 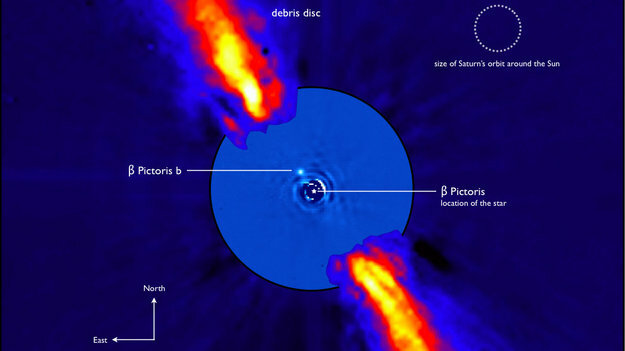 In the 22 months of observations included in Gaia’s second data release, published in April, the satellite has recorded the star Beta Pictoris about thirty times. That, however, is not enough. Combining the Gaia measurements with those from ESA’s Hipparcos mission, which observed Beta Pictoris 111 times between 1990 and 1993, enabled Ignas and Anthony to get their result much faster. This led to the first successful estimate of a young planet’s mass using astrometric measurements. “By combining data from Hipparcos and Gaia, which have a time difference of about 25 years, you get a very long term proper motion,” says Anthony. Phase diagram of the simulated interior of an Earth-like planet. It shows the different compounds that make up the mantle for varying depths. No image credit. We get excited when hearing the news of a newly discovered planet inside the habitability zone of a star. But caution is advised: being actually habitable is much more involved than simply having the right amount of irradiation. Other aspects such as the chemical composition of a planet’s atmosphere and crust are key for life as we know it to flourish. The challenging nature of precisely measuring the chemistry of stars is daunting but, according to today’s paper, we may actually be capable of inferring about planetary mineralogy for our closest extrasolar neighbors. Since directly measuring the composition of the solid innards of an exoplanet is far beyond our current capabilities, we often rely on indirect methods to infer about their bulk composition. For instance, if we measure the radius of a planet using the transit method and then its mass using radial velocities, then we can estimate its density. But this relation doesn’t provide enough fine details to allow an inference about, say, the size and composition of the core and mantle of the planet — i.e., its mineralogy. However, our current hypotheses on how planetary systems form suggest that the chemical composition of a star and the planets that orbit around it should be strongly connected. This means that, in principle, we could infer about the mineralogy of a planet if know the composition of the host star well enough. 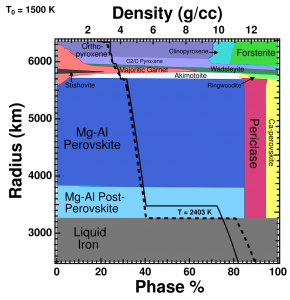 Relative chemical abundances are key to habitability, such as the molar (number of atoms) ratio between iron and magnesium (Fe/Mg), which affects the size of a planet’s core and consequently the heat transfer to the surface. Another example is the presence of volatile elements (those that like to stay in gaseous phase) in the crust, which influence tectonic movement and geochemical cycles. The major controls in planetary mineralogy are the ratios of the elements magnesium, aluminum, silicon, calcium, and iron. Such ratios are routinely measured in atmospheres of stars, although with varying degrees of precision. The overall idea of today’s paper is to assess if we can measure these abundances in stars in the solar neighborhood precisely enough to make any inferences about the mineralogy of putative rocky planets around them. In order to do that, the authors used the Hypatia Catalog of stellar measurements: they selected 10 nearby well-known stars with reliable chemical abundance estimates and started digging (see Fig. 1). Figure 1. 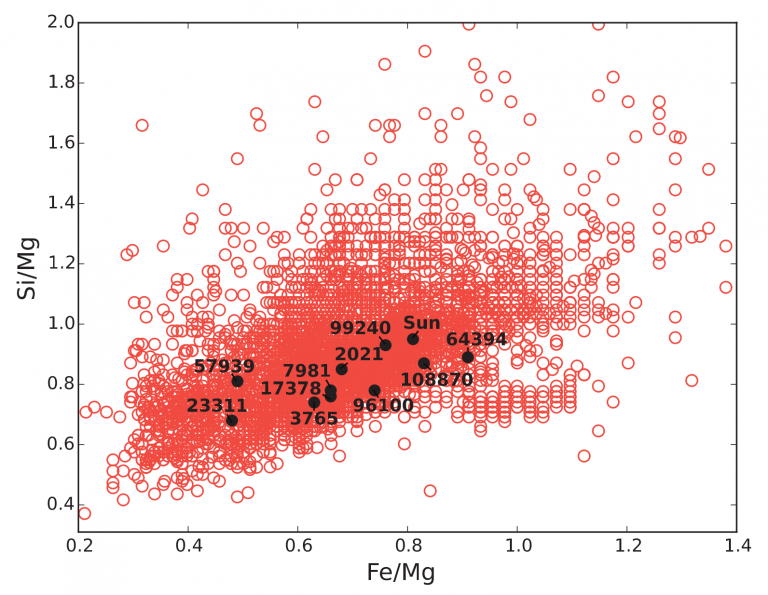 Molar ratios (fraction of the number of atoms) of silicon and iron over magnesium for the entire Hypatia Catalog (red symbols) and the selected 10-star sample plus the Sun (black dots). These stars were selected for their low uncertainties in molar ratios. 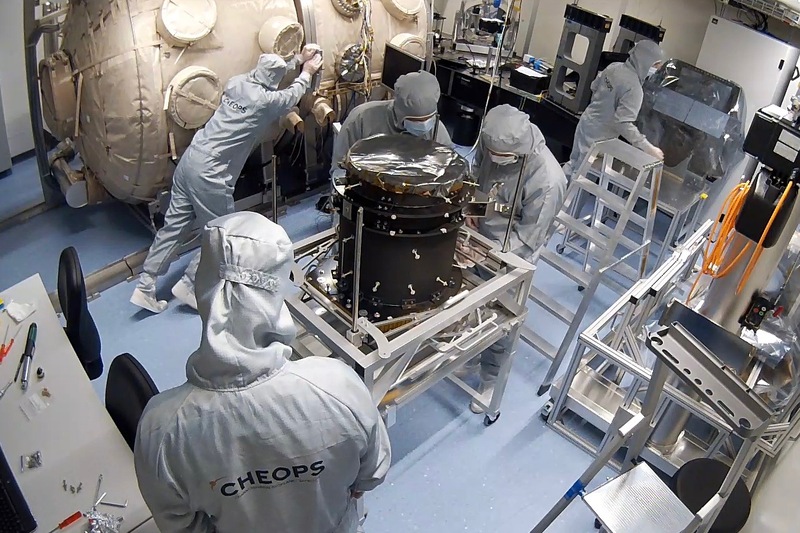 Engineers at the University of Bern are developing the CHEOPS space telescope. From Earth´s orbit, this telescope is supposed to measure the diameter of exoplanets which are light-years away from us and pass in front of their host star. Swiss astronomers had the idea for CHEOPS back in 2008. Willy Benz, professor at the Physics Institute at the University of Bern, actually wanted to travel during a semester-long sabbatical in 2008. Instead of spending this sabbatical at foreign universities, the astrophysicist sat at his desk at home and worked on a research proposal. The Swiss National Science Foundation had announced that they would be appointing new National Centres of Competence in Research (NCCR) and Willy Benz wanted to submit a proposal for planetary research together with his colleague in Geneva, Didier Queloz. In 1995 the former doctoral student Queloz and his supervising professor Michel Mayor discovered the first exoplanet orbiting a sun-like star. Benz also received his doctorate from Mayor at the University of Geneva nine years earlier. Already in 2000, Benz submitted a proposal for a National Centre of Competence in Research on exoplanetary research to the National Science Foundation, but his proposal was rejected. “That’s science fiction, they told me in an interview back then,” recalls the astrophysicist. In the year 2000, dozens of exoplanets had already been identified, in 2008 there were 300, today there are more than 3,000. The first of these distant planets orbiting sun-like stars were discovered by astronomers who were able to demonstrate that the host stars move periodically towards and away from us because both star and planet rotate around their common centre of mass under the influence of gravity. This technique is called the radial velocity method. It works well with bright stars (at least 11 mag) and provides measurements to calculate the mass of the planet. Soon astronomers also used a second method: If a planet passes directly in front of its star, it causes a kind of mini-eclipse; the brightness of the star periodically decreases by a tiny fraction. Thanks to these so-called transits, the diameter of the planet can be determined. The French satellite COROT, which was launched in 2006, and later NASA’s Kepler mission, used the transit method with great success. “In the field of astrophysics today, progress is mostly made thanks to new instruments,” explains Benz. 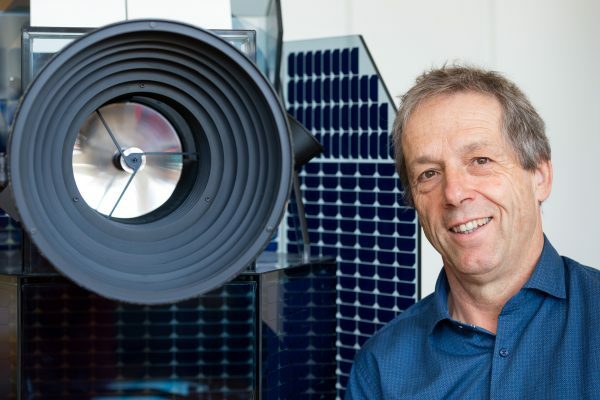 “When we worked on our second NCCR proposal in 2008, we wanted to propose not only scientific research projects but also the construction of hardware, including a Swiss exoplanetary satellite.” This satellite was supposed to be unique because of a new observation strategy. “Transit measurement is a great method,” explains the expert, “but, unfortunately, it has almost only identified planets whose stars are not very bright.” Their average magnitude is only 14 to 15. The explanation for this is that only a very small percentage of the stars are orbited by planets whose orbits lie exactly in our line of sight. If you really want to discover transits, you have to target a large number of stars. COROT and Kepler targeted about 100,000, but this was only possible because the satellites were limited to a narrow region. The bright stars, however, are spread all over the sky. “At the time, we thought it would be possible to build a small satellite that would not focus on a narrow area, but would observe bright stars everywhere in the sky, stars that are already known to possess a planet because of the radial velocity method,” Benz explains. The combination of the two detection methods is particularly interesting. If the mass is known on the basis of the radial velocity and the diameter of a planet is known due to the transit, its density can be calculated. “We then know whether the planet is mainly composed of rock or gas,” says Benz – a particularly important result in the context of the search for Earth-like planets. The astrophysicist did not give up and was later able to negotiate with the rector of the University of Berne and the State Secretary for Education and Research on how the dream of a Swiss satellite could still be pursued. As a result of his persistence, the federal government and RUAG financed the feasibility report as industrial representatives, and the University of Bern founded the “Center for Space and Habitability” (CSH). “In the feasibility report, we quickly realized that the satellite project alone would be too expensive for Switzerland,” Benz says. Sweden and Austria, where RUAG operated its branches, were the first European partners, and others soon followed. While the Swiss were still working on the CHEOPS feasibility study, the European Space Agency (ESA) was discussing the possibility of a new satellite programme. In addition to the existing large and medium-sized (L- and M-class) missions, the smaller ESA member states in particular wanted to launch an S-class mission. The development time for these missions should not exceed four years and the cost should not exceed a prescribed limit set by ESA. The ESA Member States agreed on an experiment and issued a first S-mission call in March 2012. As chairman of the scientific committee advising ESA, Benz was well informed about the discussions and decisions of the ESA delegates – and was prepared to participate in the call for proposals with the CHEOPS study. While most of the others had only three months to work out their proposals, the Swiss could rely on the extensive preparatory work done in the feasibility study and benefit from Benz’s ‘insider’ knowledge. “I knew the objections and doubts that some ESA delegates had previously put forward, and I made sure that we went in the right direction in our proposal and, for example, prevented cost explosions.” Although they originally wanted to use CHEOPS to observe the transits in two different wavelengths, they decided against an infrared instrument for cost reasons. CHEOPS started as a joint project between Switzerland and ESA. The University of Bern is responsible for the construction of the space telescope and heads the consortium of 11 ESA member states participating in the mission. The satellite platform will be built in Spain. The mission’s operations centre is also located there, while the research centre is being set up at the University of Geneva. The launch is scheduled for the end of 2018 with a Soyuz rocket from Kourou. ESA will bear half of the total costs of around 100 million Euros. Switzerland will contribute around 30 million Euros, while the other partners involved will contribute the remainder of the finances needed for this undertaking. The University of Bern (German: Universität Bern, French: Université de Berne, Latin: Universitas Bernensis) is a university in the Swiss capital of Bern and was founded in 1834. It is regulated and financed by the Canton of Bern. It is a comprehensive university offering a broad choice of courses and programs in eight faculties and some 150 institutes. With around 17,512 students, the University of Bern is the third biggest University in Switzerland. The University of Bern operates at three levels: university, faculties and institutes. Other organizational units include interfaculty and general university units. The university’s highest governing body is the Senate, which is responsible for issuing statutes, rules and regulations. Directly answerable to the Senate is the University Board of Directors, the governing body for university management and coordination. The Board comprises the Rector, the Vice-Rectors and the Administrative Director. The structures and functions of the University Board of Directors and the other organizational units are regulated by the Universities Act. The University of Bern offers about 39 bachelor and 72 master programs, with enrolments of 7,747 and 4,523, respectively. 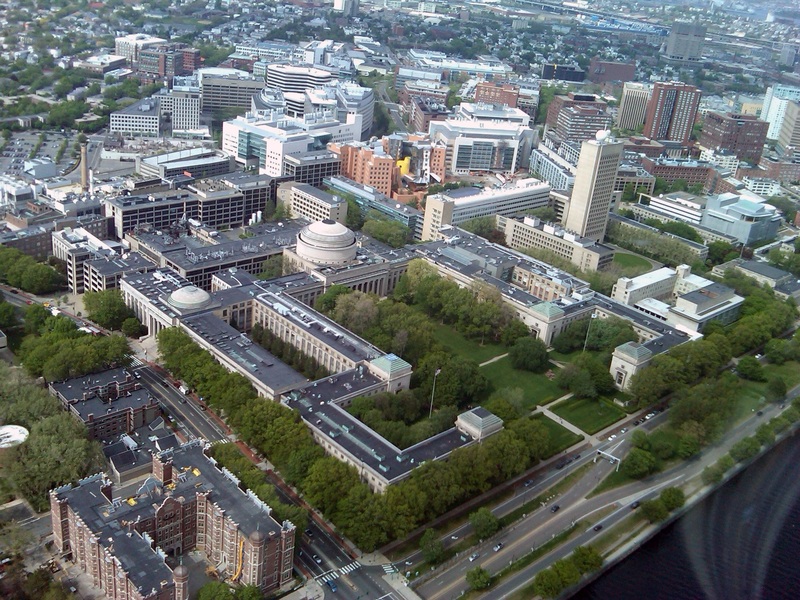 The university also has 2,776 doctoral students. Around 1,561 bachelor, 1,489 master’s degree students and 570 PhD students graduate each year. For some time now, the university has had more female than male students; at the end of 2016, women accounted for 56% of students. 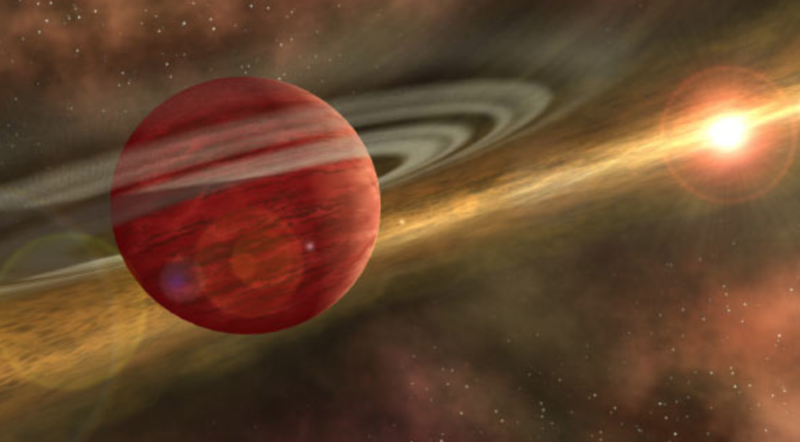 When the first exoplanet was identified via the radial velocity method, the Swiss team was able to detect a wobble in the star 51 Pegasi at a rate of 50 meters per second. The wobble is the star’s movement back and forth caused by the gravitational pull of the planet, and in that first case it was dramatic — the effects of a giant Jupiter-sized planet orbiting extremely close to the star. Many of the early exoplanet discoveries were of similarly large planets close to their host stars, but it wasn’t because there are so many of them in the cosmos. 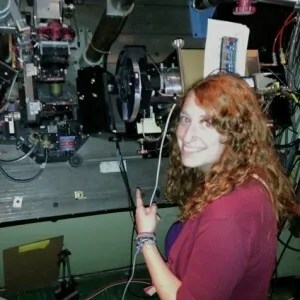 Rather, it was a function of the capabilities of the spectrographs and other instruments used to view the star. They were pioneering breakthroughs, but they didn’t have the precision needed to measure wobbles other than the large, dramatic ones caused by a close-in, huge planet. That was the mid 1990s, and radial velocity astronomers have worked tirelessly since to “beat down” that 50 meters per second number. And twenty years later, RV astronomers using far more precise instruments and more refined techniques have succeeded substantially: 1 meter per second of wobble is now achieved for the quietest stars. That has vastly improved their ability to find smaller exoplanets further from their stars and is a major achievement. 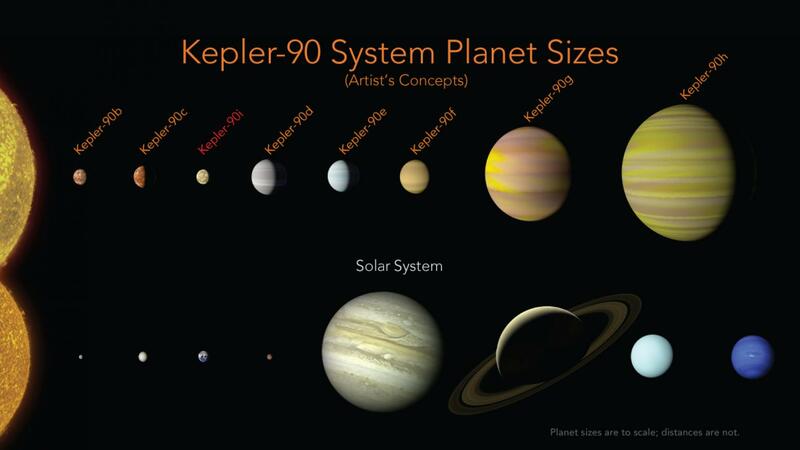 But it has nonetheless been a major frustration for astronomers because to detect terrestrial exoplanets in the Earth-sized range, they have to get much more precise — in the range of tens of centimeters per second. A number of efforts to build systems that can get that low are underway, most notably the ESPRESSO spectrograph scheduled to begin work on the High Accuracy Radial Vlocity Planet Searcher (HARPS) in Chile next year. Then earlier this month an ambitious NASA-National Science Foundation project was awarded to Penn State University to join the race. The next-generation spectrograph is scheduled to be finished in 2019 and installed at the Kitt Peak National Observatory in Arizona, and its stated goal is to reach the 20 to 30 centimeters per second range. Suvrath Mahadevan, an assistant professor at Penn State, is principal investigator for the project. It is called NEID, which means ‘to see’ in the language of the Tohono O’odham, on whose land the Kitt Peak observatory is located. NASA and the NSF wanted the new spectrograph built on an aggressive timetable to meet major coming opportunities and needs, Mahadevan said. The speedy three-year finish date is a function of the role that radial velocity detection plays in exoplanet research. While many planets have been, and will be, first detected through the technique, it is also essential in the confirming of candidate planets identified by NASA space telescopes such as Kepler, the soon-to-be launched TESS (the Transiting Exoplanet Survey Satellite) and others into the future. There is a huge backlog of planets to be confirmed, and many more expected in the relatively near future. What’s more, as Mahadevan explained, an instrument like NEID could significantly help NASA’s planning for a possible 2030s Flagship space telescope mission focused on exoplanets. Two of the four NASA contenders under study are in that category — LUVOIR (Large Ultraviolet Visible Infrared) Surveyor and Hab-Ex — and their capabilities, technologies, timetables and cost are all now under consideration. If NEID can identify some clearly Earth-sized planets in habitable zones, he said, then the planning for LUVOIR or Hab-Ex could be more focused (and the proposal potentially less costly.) This is because the observatory could be designed to look at a limited number of exoplanets and their host stars, rather than scanning the skies for a clearly Earth-like planet. These possibilities, however, are for the future. Now, Mahadevan said, the Penn State team has to build a re-considered spectrograph, a significant advance on what has come before. With its track record of approaching their work through interdisciplinary collaboration, the Penn State team will be joined by collaborators from NASA Goddard Space Flight Center, University of Colorado, National Institute of Standards and Technology, Macquarie University in Australia, Australian Astronomical Observatory, and Physical Research Laboratory in India. Much of the work will be done over the next three years at Penn State, but some at the partner institutions as well. 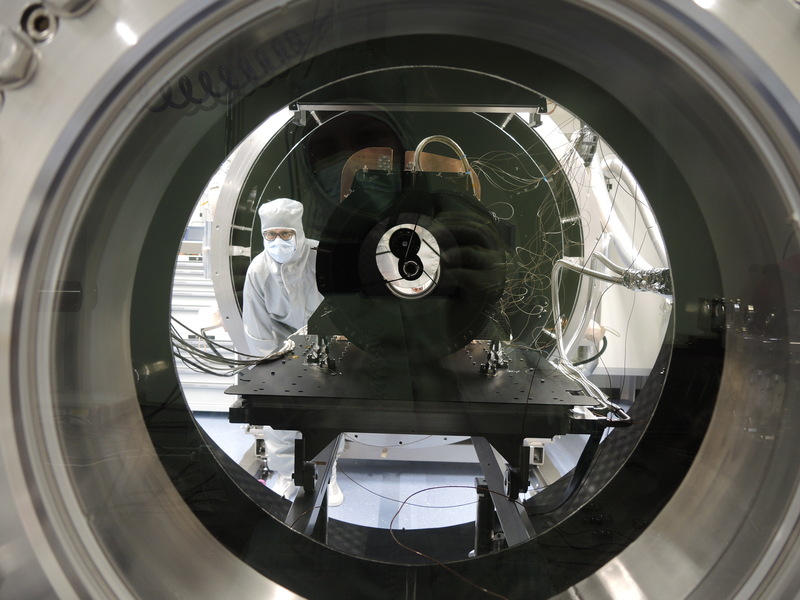 Key to their assembly approach is that the instrument will be put together in vacuum-sealed environment and will have no vibrating or moving parts. This design stability will prevent, or minimize, instrument-based misreadings of the very distant starlight being analyzed. A major issue confronting radial velocity astronomers is that light from stars can fluctuate for many reasons other than a nearby planet — from sunspots, storms, and other magnetic phenomena. The NEID instrument will try to minimize these stellar disruptors by providing the broadest wavelength coverage so far in an exoplanet spectrograph, Mahadevan said, collecting light from well into the blue range of the spectrum to almost the end of the red. “We’re not really building a spectorograph but a radial velocity system, he said. That includes upgrades to the telescope port, the data pipeline and more. This is how Lori Allen, Associate Director for Kitt Peak, described that new “system”: “The extreme precision (of NEID) results from numerous design factors including the extreme stability of the spectrometer environment, image stabilization at the telescope, innovative fiber optic design, as well as state-of-the-art calibration and data reduction techniques”. 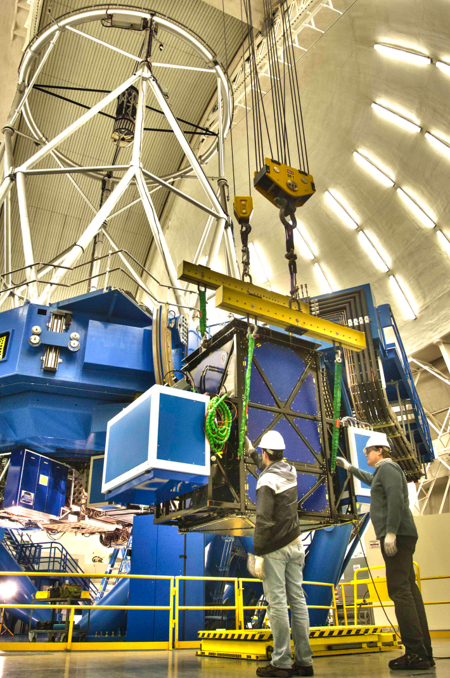 The new generation spectrograph will be installed on the 3.5 meter WYN telescope at Kitt Peak. The site is managed by the National Optical Astronomy Observatory, and $10 million spectrograph project is a collaboration of NASA and the National Science Foundation. Sixteen teams ultimately competed to build the spectrograph, and the final two contenders were Penn State and MIT. Mahadevan said that, in addition to its spectrograph design, he believed several factors helped the Penn State proposal prevail. His team has worked for several years on another advanced spectrograph for the Hobby-Eberly Telescope in Texas, one that required complex vacuum-sealed and very cold temperature construction. Although the challenges slowed the design, the team ultimately succeeded in demonstrating the environmental stability in the lab. So Penn State had a track record. 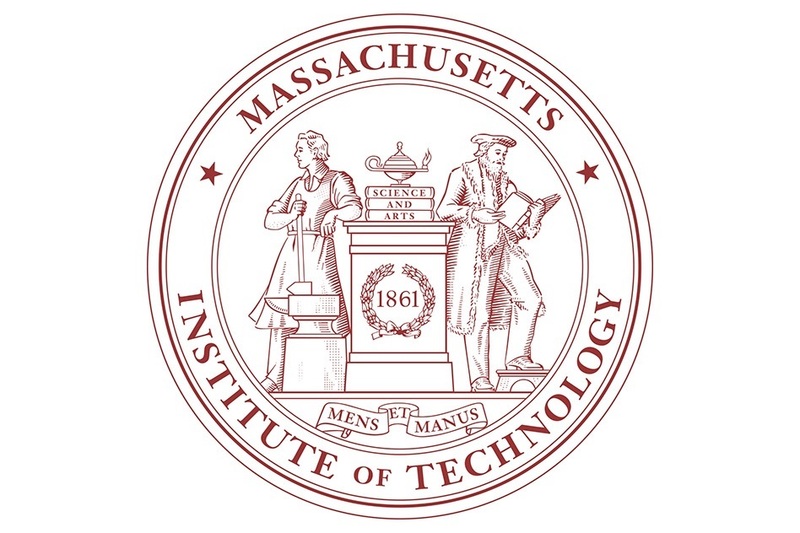 What’s more, the school and its Center for Exoplanets and Habitable Worlds have a history of working in an interdisciplinary manner, and have been part of several NASA Astrobiology Institute projects. The Kitt Peak observatory, which saw first light in 1994, has been the sight of many discoveries, but in recent years has faced cutbacks in NSF funding. There was some discussion of reducing its use, and the NASA-NSF decision t0 upgrade the spectrograph was in part an effort to make it highly relevant again. And given the scientific need to confirm so many planets — a need that will grow substantially after TESS launches in 2017 or 2018 and begins sending back information on thousands of additional transiting exoplanets — enhancing the capabilities of the Kitt Peak 3.5 meter telescope made sense. Kitt Peak is unusual in being open to all comers with a great proposal, whether they’re from the U.S. or abroad. The Penn State team and partners will get a certain number of dedicated night to observe, but many others will be allocated through competitive reviews. And so when NEID is completed, astronomers from around will have a shot at using this state-of-the-art planet finder.